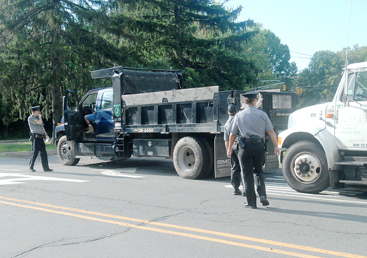 CRACKING DOWN: Last week saw the continuation of the joint effort by Lawrenceville, Princeton Borough, and Township police to discourage trucks from using Princeton streets and Route 206 in order to save turnpike tolls. Sgt. Robert Toole and Officers Kin Hodges and Melissa Martinez of the Township police force were on hand to monitor passing trucks for proper tags and licenses. The impending closing of the Tulane Street parking lot as part of Phase II of the downtown redevelopment plan sparked concern among residents, merchants, and Council members last Tuesday. Despite the Coalition for Peace Actions (CFPA) recent victory in its four-year-old court battle to mandate that all votes cast in New Jersey have a Voter Verified Paper Ballot (VVPB) as a legal record, Coalition for Peace Action Chair Irene E. Goldman is anxious. Using the phrase civil defense in a recent conversation, she was not referring to air raid sirens or the like. What she was referring to was preparation for the use of paper ballots in the coming November election. In a time of high gas prices, global warming, melting polar ice caps, and related problems, Princeton University will be able to focus on finding answers to questions about energy and environment thanks to a $100 million gift from alumnus Gerhard Andlinger. The monies will go to the creation of the Gerhard R. Andlinger Center for Energy and the Environment, which will be part of the School of Engineering and Applied Sciences. Capture the (Rubber) Chicken is definitely not among the events at the upcoming Beijing Olympics, but it figured prominently in the Princeton YMCA Discovery Camps Olympicactivities last week. This takes the love of literature to a higher level, said Alex Carpenter, the lead singer and guitarist of the Remus Lupins. He was referring to wizard rock (wrock), underground independent music inspired by J.K. Rowlings Harry Potter series. While many distance runners nervously set their watches or re-tie their shoes as part of their pre-race routine, Ashley Higginson takes a radically different approach. Recently graduated Princeton University mens lacrosse star Dan Cocoziello learned a lot from Tiger head coach Bill Tierney over the last four years. Waving his helmet and hollering out extended whoops, former Princeton High star lineman Jordan Simpson led the cheers last Wednesday night after the East all-star squad prevailed in the Sunshine Football Classic. In Malcolm Lowry’s Under the Volcano there’s a passage devoted to the Consul’s library, which includes, among other quaint and curious volumes, Dogme et Ritual de la Haute Magic, Serpent and Shiva Worship in Central America, “numerous cabbalistic and alchemical books,” Gogol, the Mahabharata, Blake, Tolstoy, the Upanishads, Bishop Berkeley, Duns Scotus, Spinoza, Shakespeare, All Quiet On the Western Front, the Rig Veda — and Peter Rabbit. Only connect, E.M. Forster said in the epigraph to his novel, Howards End. Pat McKinley may or may not have read the book (heaven knows where she would find the time), but, through her work and her music, she seems to take the art of connecting to new heights. While area toddlers  many of them now young adults  have happily clapped their hands at Ms. McKinleys numerous library sing-alongs and local birthday parties over the years, she also brings her music (and academic degrees) to bear in her work with very young children and older adults who are deaf and blind. She refers to her patients as my babies, and my children. Her real-life children are Erin, who these days is coaching a swim team in Hong Kong, and Thomas, a pole-vaulting star at Slippery Rock University.